Here’s a classic just for you and yes, at the end, we have a giveaway too! As the Peanuts gang said, “Christmas time is here…” and we’d like to offer you some special gifts! 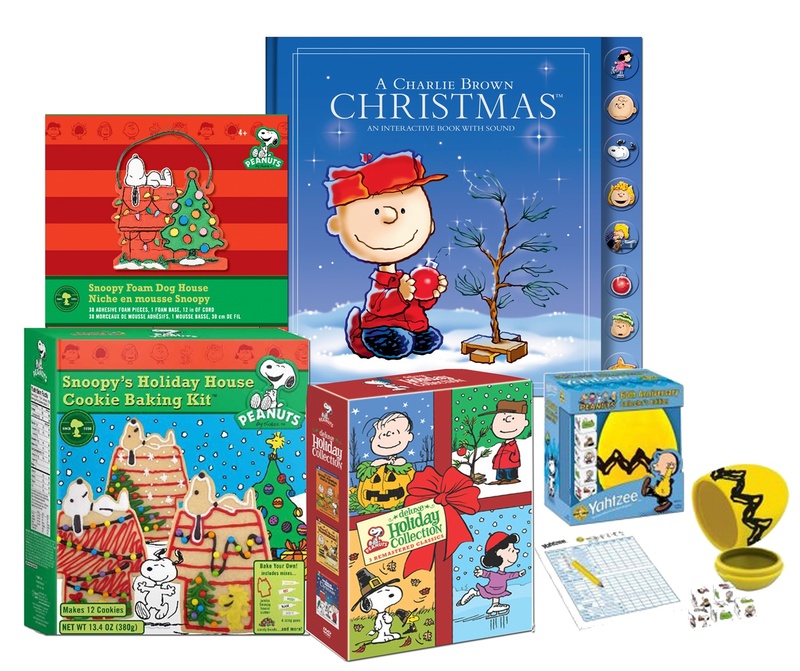 We have a great giveaway to offer, with these charming holiday gift items: Snoopy’s Holiday House Cookie Baking Kit; PEANUTS Arts & Crafts Kit; Hallmark’s “A Charlie Brown Christmas” interactive book with sound; PEANUTS 60th Anniversary limited edition Yahtzee; and Warner Home Video’s Deluxe Holiday DVD collection. To enter, simply post a comment about your favorite Christmas/Holiday tradition. Winners will be picked in a random drawing on Monday, Dec. 20th. For additional entries, Tweet about your fave holiday tradition @suburbanmama use hashtag #peanutsgiveaway GOOD LUCK! Our favorite family tradition is having our Christmas “festival” where we bake…make crafts…and spend a whole day celebrating together as a family! My favorite holiday tradition is watching Christmas movies with my family with a fire in the fire place and eating tons of pizza! @allison sounds awesome. merry Christmas! @michelle yes i can imagine the challenge. btw, real tree or artificial? just curious. My favorite holiday tradition is getting together with all of my aunts & cousins to make tamales the weekend before Christmas. It’s a huge get together that we’ve been doing for years. Congratulations you won the other gift pack! My favorite holiday tradition is making homemade candy to give to friends and family. Especially love to see people’s faces as they dig in! It’s random but ever since we lived in FL, we’d go out for Chinese food after mass since it was the only thing open. I continue that tradition now in CA! Our holiday tradition is on Christmas Eve going to mass and afterwards eating Clam Chowder and Grilled Cheese sandwiches. Love Charlie Brown! Our tradition consists of opening a special ornament and pj’s on Christmas eve drinking egg nog and watching Christmas Story…Fa Ra Ra Ra Ra Ra Ra Ra Ra!! @lisa the kids like egg nog? Going to the Christmas Eve church service as a family is one of my favorite Christmas traditions. Thank you so much for sharing Lisa.